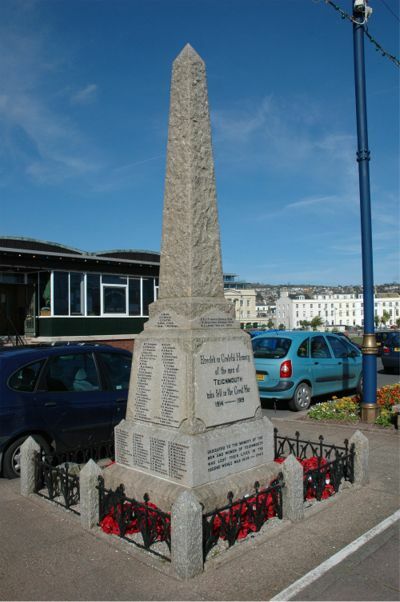 "A gathering of upwards of two thousand assembled on Saturday afternoon, on the Den, Teignmouth, to witness the unveiling and dedication of the memorial erected by the town in memory of the 170 inhabitants who fell in the late Great War. In keeping with the occasion, the proceedings were most solemn and reverent. Colonel F. B. Mildmay, M. P., who was accompanied by Mrs. Mildmay, unveiled the memorial, an obelisk of Dartmoor granite, with a base of the same material 4 ft. 6 in. square, the total height being 19 ft. It is erected in one of the narrow green swards on the top of the Den and is situated midway between the Pier entrance and the lighthouse. The memorial has cost about £250, which sum has, within a few pounds, been raised by public subscription. Messrs T. H and B. Knight and Sons, the contractors, bearing in mind that the memorial is exposed to the spray from the sea, have, at their own expense - at a cost of £30 - done the lettering in beaten lead, the most durable of substances. The names of the fallen are inscribed on the other three panels, and contains the names of four members of one family and three members of three other families."